After playing through The Witch and the Hundred Knight I had hoped for a second game and Nippon Ichi Software have answered my prayers. The game makes a welcome return with a new cast of characters but do they stand up to same dark twisted story that Metallia gave us? 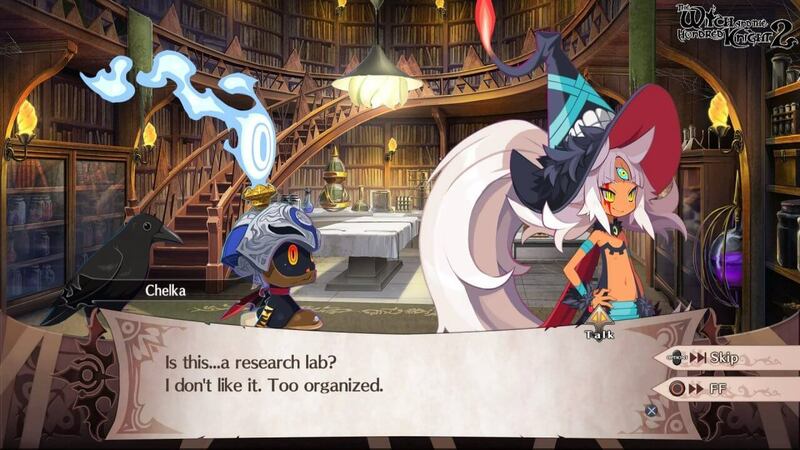 The Witch and the Hundred Knight 2 takes place in the fictional world of Kevala that is plagued by a Witch’s disease. A girl named Amalie lives in a small village and in a state of panic is searching for her younger sister named Milm who has disappeared. Milm shows up with clear signs of catching the Witch’s disease and Amalie and Milm are both exiled from the Village and Amalie is in a desperate state to save her younger sister. Soon after the initial opening of the game you take control of the Hundred Knight and begin your adventure while becoming familiar with the game by doing some short tutorials. 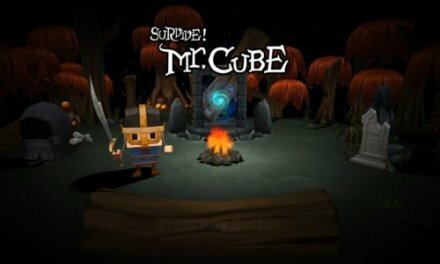 These are pretty short and simple and by the end I had pretty much become accustomed to the controls; there is also little difference to the first game so if you have experience with the original then the controls will likely be second nature. You attack by chaining your five currently equipped weapons together and can range from Swords to Lances and Hammers. Each weapon has its own strengths and its own weaknesses so while one weapon may be good for taking down an enemy another will not; this is not usually a problem as you can take out smaller enemies quickly even if your attacks are ineffective although bigger enemies will be more difficult to take down. Swords are a well rounded weapon while Hammers are more slow and difficult to hit the mark but when they do they hit much harder. You do gain different Facets which have their own aptitude to weapons and resistances. Facets can be changed at any time even during battle so equipping these with weapons of the right proficiency can turn the tide of battle very quickly. Skills are learned once you gain skills points and extra points are used to increase each skills efficiency with each skill having a small cool-down in battle. Gigacals are back again and work much like before; once you have done a combo on your enemies you have a chance to leap at them and devour them provided they have low enough health left. By devouring your enemies The Hundred Knight stays in a healthy stasis. Should the Gigacals be at nothing then The Hundred Knight will weaken considerably even if he is at full health. It is always best to think of Gigacals as a hunger bar; you need to keep a check but you will find it isn’t all that difficult even in the longer fights such as boss battles. Consuming enemies this time round does not produce waste in the Hundred Knights stomach. Instead any items that Hundred Knight finds are stored in his stomach and once a stage is complete or when he returns to town the items stored become part of the players Inventory. Should Hundred Knight die then he will lose maybe one or several items that he has consumed depending on how many collected; on top of losing quite the portion of Gigacals. This while not the worst punishment should be avoided especially if you find an item you are definitely not wanting to lose. 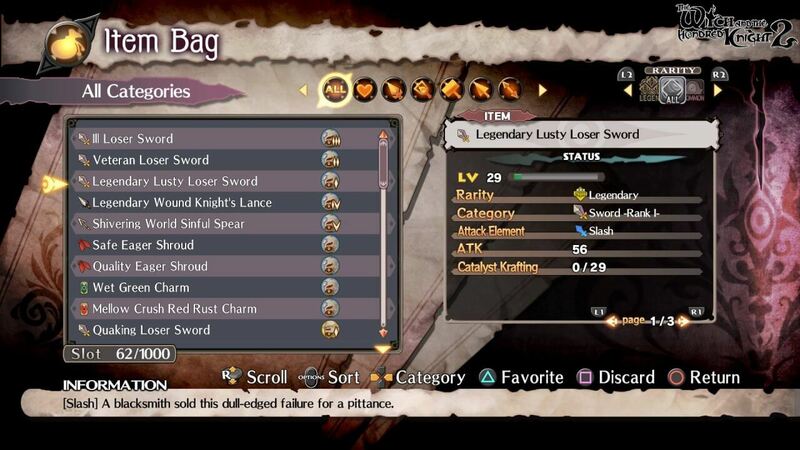 The upgrading system is nice while not overwhelming it is crucial to making weapons worth using. There are various tiers of rarity from Common to Legendary with the latter being the most sought after and the choice for upgrading aswell as upgrade components. 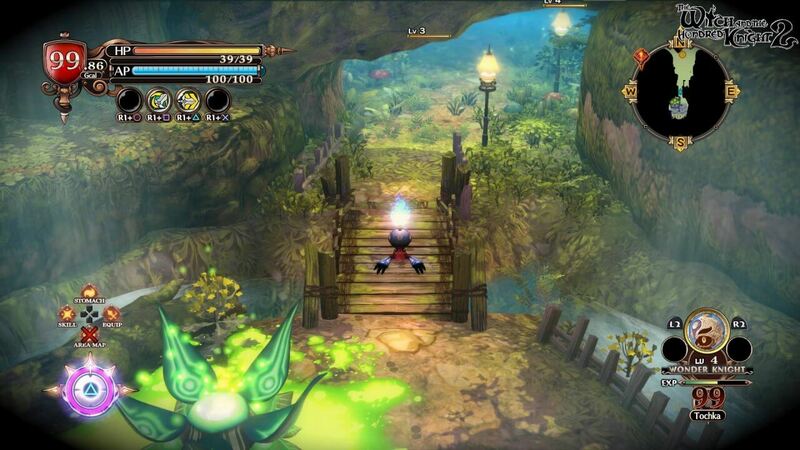 The Witch and the Hundred Knight may initially seem like an easy game but soon things can get tricky especially when some of the harder hitting enemies can take you out quite quickly. I’ve died quite a few times from not being prepared for a group of enemies and even after grinding for a few levels and upgrading my equipment I still died. Some enemies are stronger than others and these are obvious by the glow that surrounds them. Mastering the dodge and keeping up with your hunger are all things which will come naturally and work in your favour. Dodging just as the enemy strikes will initiate a slow down of the enemy where The Hundred Knight can rain down on the enemy and strike with a flurry of attacks. Boss setups are great as they can be long difficult but also are well done that they actually are challenging where you can lose easily if you mess up. Keeping up your Gigacals is one of the more tricky aspects of these battles as the boss is for the most part alone and should the fight take longer then you may run out faster. Fortunately bosses can summon enemies which you will have to take out and devour while at the same time avoiding the boss and its most timely of attacks. Should you have food items too then these will help but ultimately there is a lot more to keep your third eye on in these battles. 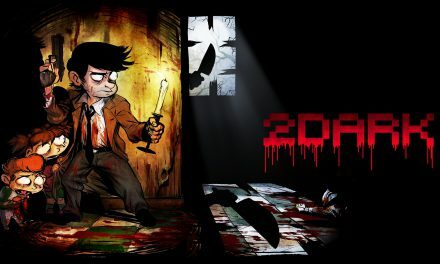 The only downside I have found with this game much like with the first is the maps full of similar mobs and instead of a map feeling somewhat grand, it can feel like a bit of a grind and just the same button mashing until you reach the next zone or you can simply run through them all. 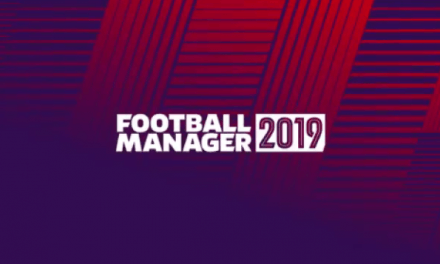 The general idea and overall presentation though is well delivered; the characters show emotion and the game definitely feels immersive with its bright colour pallet in an otherwise gloomy world. The Witch and the Hundred Knight 2 delivers on character and the English VA’s are superb when it comes to this series and the characters are very much bought to life and it shows. 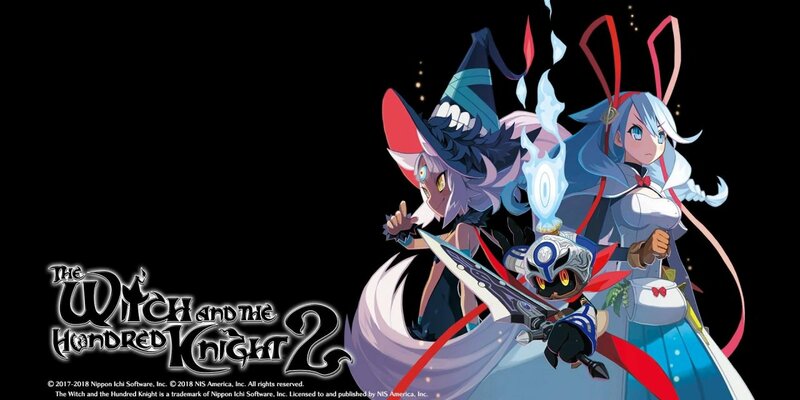 Summary Overall The Witch and the Hundred Knight 2 makes some fine tweaks to its original battle design and makes for a very worthy follow up. The right balance between combat and story driven gameplay with a splash of humour that Disgaea is known for is sure to appeal to fans and newcomers alike. 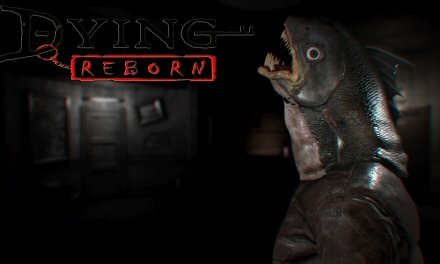 If you didn't like the first one then there isn't anything here for you but otherwise it is a game that definitely deserves a chance.